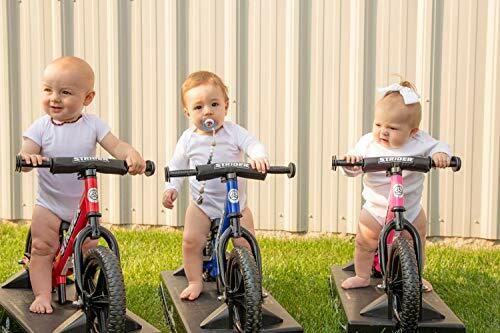 Babies everywhere are clapping their chubby little hands over the fact that they too can now ride – or play – on a bike. As soon as your little one begins to crawl, they’re pretty much telling you they’re ready to explore and don’t plan to stop…at least not until nap time. 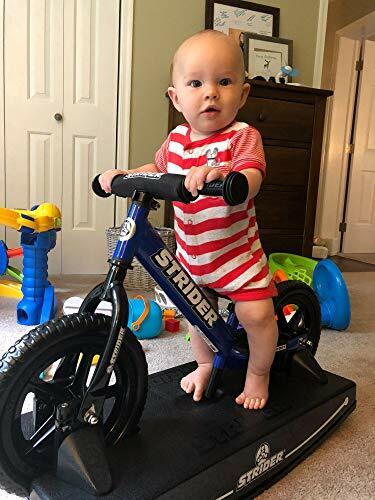 The Strider Baby Bundle is the best way to teach balance and improve dexterity, cognitive ability, and spatial awareness (yeah, a kid’s bike company totally knows what those are). Besides eating, sleeping, and pooping, one of the coolest things kids do is form bonds – with parents, family members, and toys. 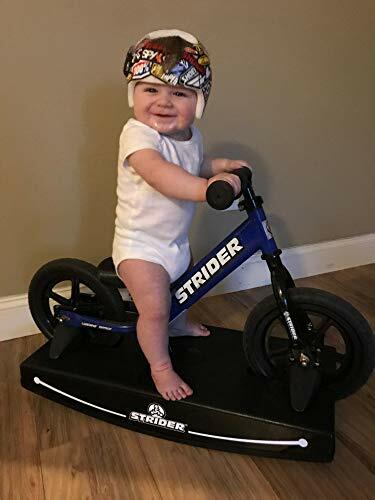 The Strider Baby Bundle helps your little bundle of biscuits bond with their very first bike before they ever take it to the rough and tumble cul-de-sac. The rocking base securely holds the Strider Sport in place as your baby literally rocks out. Eventually, they’ll be rocking so hard you’ll think they’re about to blast off into the stratosphere. Don’t worry: we disengaged the rockets. This baby (no pun intended) is all self-propelled. When your tater tot has mastered rocking and is ready to roll out, simply detach the bike. With a seat and handlebars that can be adjusted tool-free and tires that never go flat, the 12 Sport is the perfect bike to take your child from baby steps to big strides. 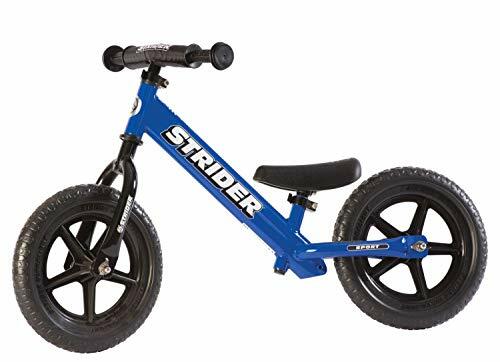 We even added a cushy, padded seat and threw in an extra-long seatpost so your child can get a longer life out of their Strider, extending the use of your 12 Pro to 36-60 months (under 60lbs). The Strider Sport has a seat height range from 30-48 cm (11-19 in. ), which means it fits children with an inseam of 30-51 cm (12-20 in.). 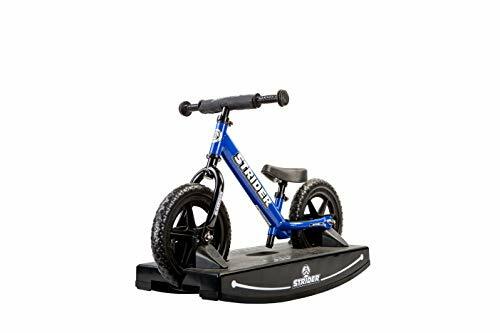 LEARN TO RIDE – The Strider Baby Bundle is the best way to teach balance and improve dexterity, cognitive ability, and spatial awareness (yeah, a kid’s bike company totally knows what those are) without training wheels. 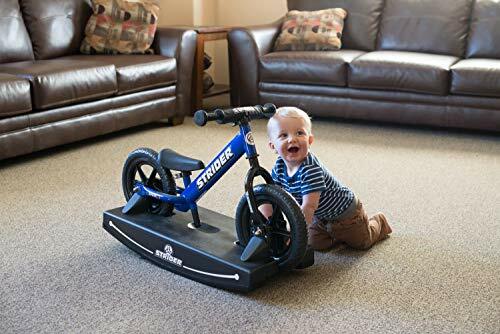 BUILT FOR PLAY – The Strider Baby Bundle helps your little bundle of biscuits bond with their very first bike before they ever take it to the rough and tumble cul-de-sac. The rocking base securely holds the Strider Sport in place as your baby literally rocks out. GROWS WITH YOUR CHILD – When your tater tot has mastered rocking and is ready to roll out, simply detach the bike. With a seat and handlebars that can be adjusted tool-free and tires that never go flat, the 12 Sport is the perfect bike to take your child from baby steps to big strides. The Strider Sport has a seat height range of 30-48 cm (11-19 in. ), comfortably fitting children with an inseam of 30-51 cm (12-20 in.). MADE FOR KIDS – The bike’s lightweight frame weighs only 3.0 kg (6.7 lbs), making it easy for your child to ride and stride. 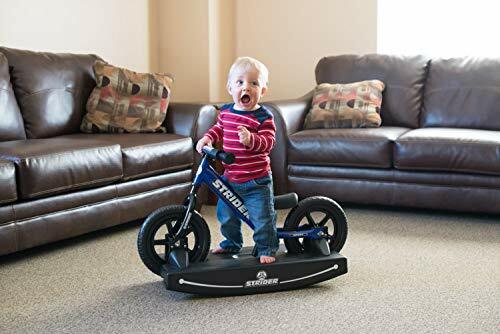 The toddler-sized grips offer better control, and the built-in footrests are perfect for learning to balance and glide.